Over the weekend I spent some time working in the garden with my pops – weeding, picking oranges, checking sugar levels on the wine grapes and harvesting a large batch of heirloom tomatoes. 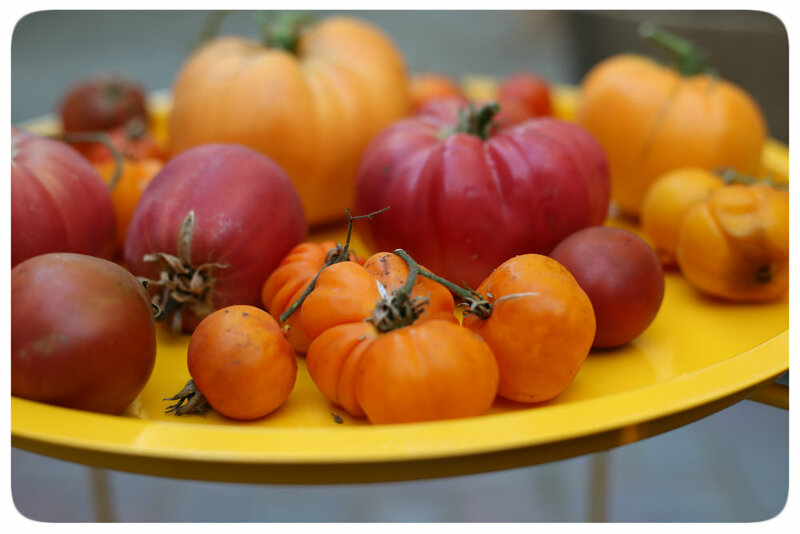 I absolutely LOVE heirlooms due to their refreshing and sweet flavor and unique colors and shapes. Now what to do with this batch of colorful beauties? Recently I experience a delicious dish from French Blue in St. Helena, California which inspired tonight’s appetizer. They offer this irresistible house made farmers cheese over grilled bread topped with strawberries and tomatoes. It’s to die for. 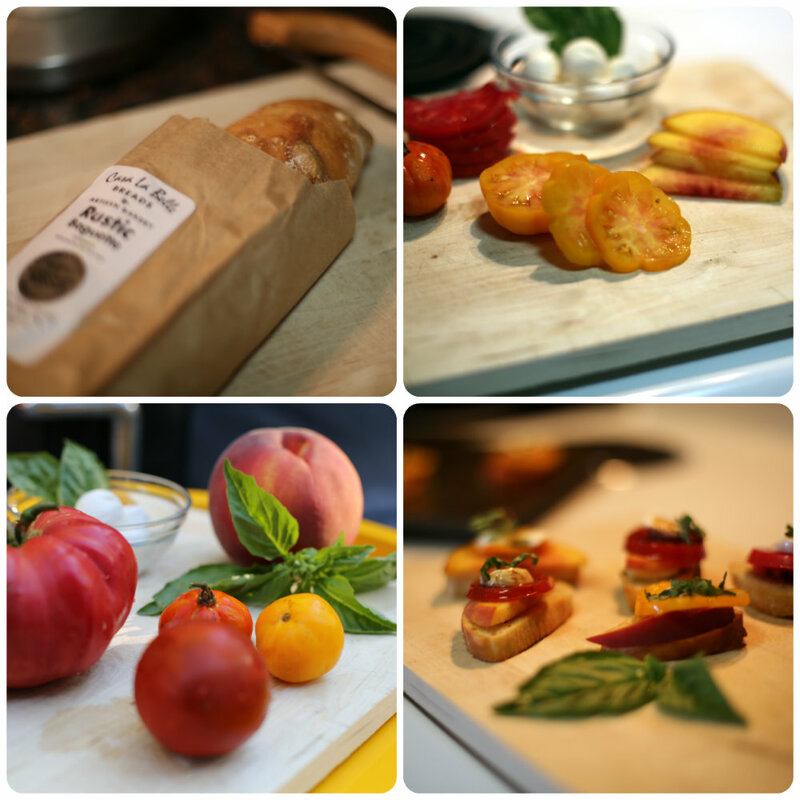 So, that is the inspiration to this Heirloom, Peach and Fresh Mozzarella crostini. Sweet and savory, this is the perfect summertime appetizer. Pre-heat the oven to 400 degrees. Slice baguette into 1/2 inch slices and coat with olive oil. Season lightly with salt & pepper and bake them for about 8 – 10 minutes until golden brown. 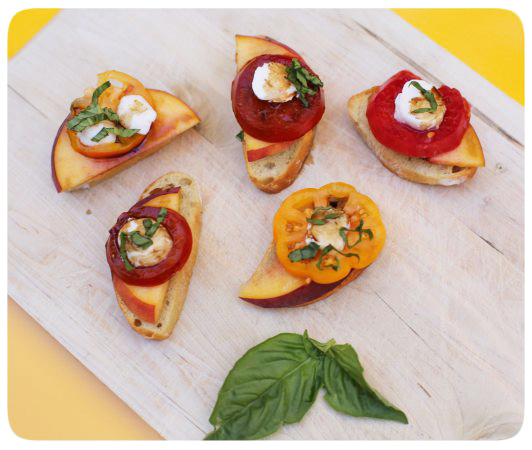 Remove crostini’s from the oven and layer with a peach slice, tomato and mozzarella. Drizzle balsamic vinegar and season with salt and pepper. Serve immediately. Casa LaBelle Bread – Casa LaBelle is a small bakery located in the tiny resort town of Monte Rio in Sonoma County. 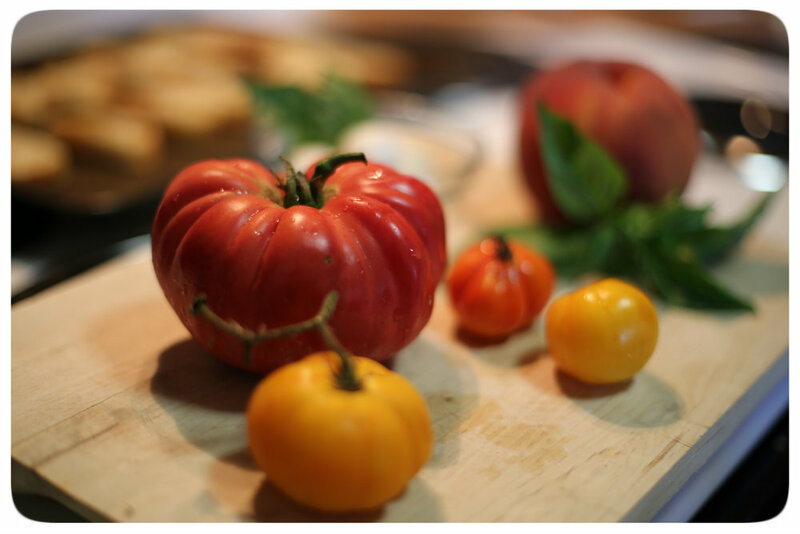 Heirloom Tomatoes – homegrown and straight from the garden. Beautiful pictures! Im new to wordpress and wonder if you could help me with answering a question; How do you get your pictures sp big, and how ddid you make the picturegrid? Right now my pictures are only one sixe and I would likte to publish them bigger!